London - Chef de mission Pieter Badenhorst says Team South Africa's 62 athletes are excited and full of anticipation for the London Paralympic Games. While Londoners are still celebrating their triumphant hosting of the Olympics, the euphoria is set to continue for the next 10 days as competition at the Paralympics gets underway on Thursday. 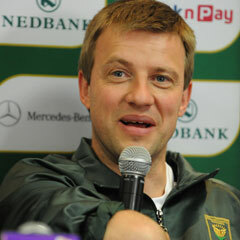 “Our spirits are high and the mood is definitely where it should be right now,” Badenhorst said on Wednesday. South Africa bagged 30 medals at the 2008 Beijing Games, finishing sixth of 148 countries in the medals table, and the SA Sports Confederation and Olympic Committee (Sascoc) has set a target of 40 medals for the London disability showpiece. They will have their first chance for a medal on the opening day of competition if swimmer Natalie du Toit, who won five gold medals at the 2008 Games, progresses to the final of the women's 100m butterfly S9 event. “We are hoping that all the guys who were successful in Beijing will repeat their performances in London, plus we are looking at a few first-time Paralympians to medal as well,” said Badenhorst, a gold medallist himself at the 1992 Barcelona Paralympics. Badenhorst believed countries like Russia and Brazil would be well placed in the standings, but he expected South Africa to still finish in the top six as they had done their homework since the last Paralympics. After Beijing, Sascoc introduced a programme of excellence (Opex) to support the athletes and potential medal winners. Badenhorst said the Opex initiative had gone a long way in assisting with their preparations. “You’ll get your top three countries up there - China, the US and Great Britain - and the Aussies are always up there somewhere,” he said. “But Russia invested heavily in the Olympics and they came from nowhere to finish fourth this year, and with Brazil being the next hosts, their investments will start to pay off early as well. “But our athletes have also received support in terms of being trained by professional coaches and having had access to a team of medical experts. “With the introduction of the Opex programme, the South Africans have been able to travel to more international competitions and some athletes have already competed in Europe two or three times this year. “So we are expecting to maintain or better our position here as well. While Pistorius stole the limelight after his historic participation in this year’s Olympics, Du Toit kept a fairly low profile in comparison. “She is training at the moment and just keeping really focussed on her events,” said Badenhorst. ** Sapa's reporter is in London as a guest of the SA Sports Confederation and Olympic Committee.